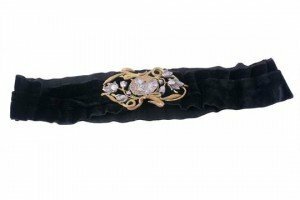 An Art Nouveau belt buckle designed by F Lasserre, circa 1900, the silvered and gilt metal buckle with a central circular poppy head panel with smiling female adorned with flowers, signed F Lasserre, between whiplash foliate border with silvered tulips. 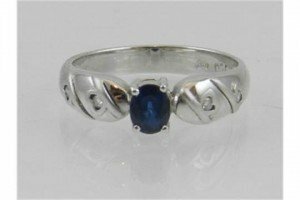 A sapphire and diamond dress ring, the circular shaped sapphire claw set between clusters of eight cut diamonds. 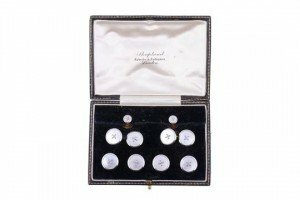 A mother of pearl gentleman’s dress set, comprising: a pair of mother of pearl cufflinks, the circular mother of pearl panels in polished settings, stamped 18ct. Together with four matching buttons and two dress studs. 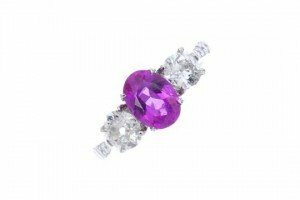 A platinum ruby and diamond three-stone ring. 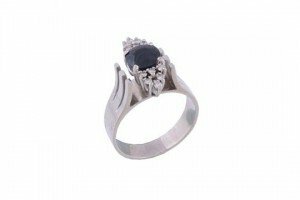 The oval-shape ruby, with old-cut diamond sides, to the graduated brilliant-cut diamond shoulders. 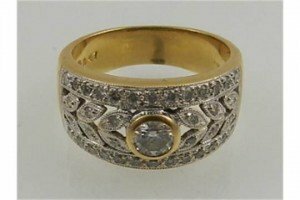 Estimated total diamond weight 1ct. A pair of amethyst ear pendants. 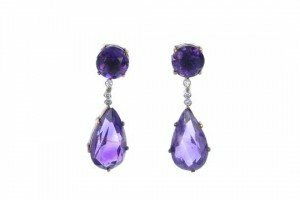 Each designed as a circular-shape amethyst, suspending an old-cut diamond line, to the pear-shape amethyst drop. 4.6 grams. 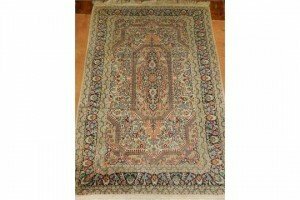 A cream ground Kashmiri part-silk prayer mat, having geometric and floral design to centre, multi-bordered and fringed. 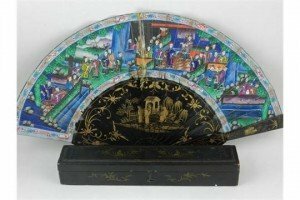 A mid / late 19th century Chinese Canton lacquered stem fan, decorated on both sides with a gathering of noble officials set amongst a terrace courtyard scene. 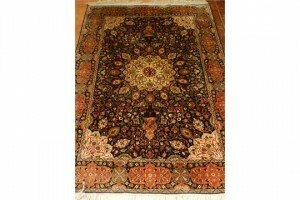 An indigo ground Kashmiri silk rug, having central medallion on a floral ground, multi-bordered and fringed. 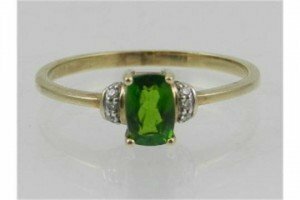 An unusual 9 carat yellow gold, Russian chrome diopside, and diamond ring, set oval cut chrome diopside, flanked by diamond accents. 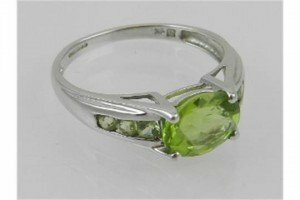 A 9 carat white gold and peridot ring, set oval cut peridot, the shoulders channel set with six round cut peridot. 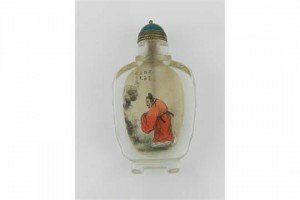 A Chinese reverse painted glass snuff bottle, decorated with noblemen in landscape scenes, bears Chinese verse. 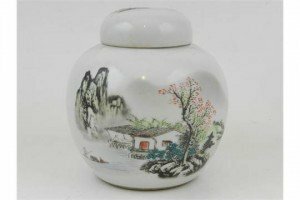 A Chinese Republic style porcelain tea jar and cover, decorated to one side with fisherman in lake scene with mountain landscape to background. 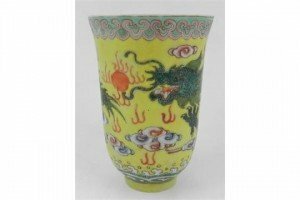 A Chinese yellow ground porcelain cup, polychrome decorated with dragons chasing flaming pearls amongst stylised clouds and waves, bears seal mark to base. 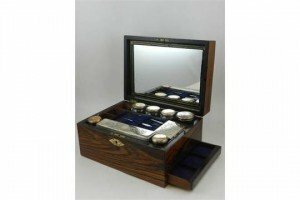 A Victorian rosewood toilet box, the hinged top centred with a mother of pearl lozenge and enclosing a fitted interior with silver plate mounted bottles and jars, fitted with a concealed end drawer. 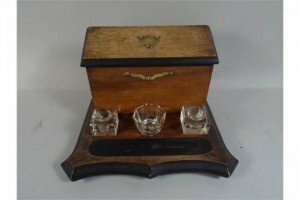 An Edwardian Brass Mounted Desktop Stationery Box with Two Ink Wells, Bowl and Pen Trough. 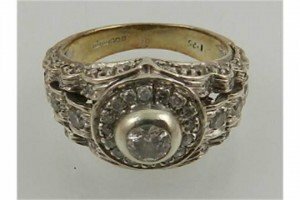 A novelty silver plated cigarette case, having Greek key border, centred with a porcelain plaque depicting a young lady. 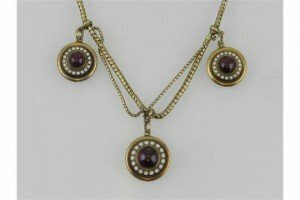 A late 19th / early 20th century yellow metal, garnet, and enamel necklace, in the Georgian taste, suspended three round pendants each set with a garnet, and interspersed with looped chain decoration.